Good morning from beautiful central Arkansas. I hope you are enjoying a nice lazy Sunday morning. We will be headed off to church here in a bit but first I wanted to show you this beautiful monochromatic card I made my lovely grandma. She is an amazing lady who does so much for my family. I used supplies that were already laying on my desk from a recent project including rose red and crumb cake cardstock along with Rose red ink. 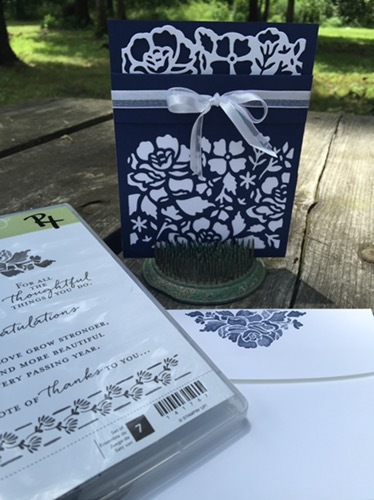 I used the Detailed Floral thinlets along with the Banners for you stamp set. I added in a couple of pearl basics on the banner but they didn’t photograph so well. They appear kind of ghostly but in actuality they are quite pretty. Makes me think of a lovely country wedding with pearls, burlap and lace. I think these sets give you a lot of bang for your buck! It looks like you did a lot more work than you actually did. Come check it out! Greetings everyone! I am going to KISS (keep it simple senorita) this day goodbye! I am so exhausted! 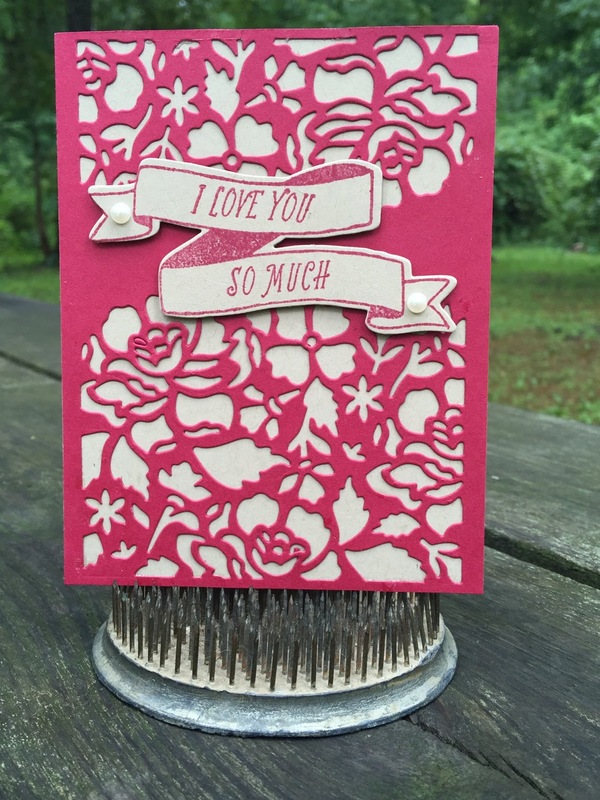 This was a super simple card I made yesterday after church using some Rose Red cardstock and ink along with some scrap of paper! What else could you ask for? We all have scraps that we can’t beat to part with right? This is a simple quick card to use some of this up! I cut a front panel that was 1/4 inch smaller than the card base and adhered 3/4 inch wide scraps to the front and trimmed off the edges. 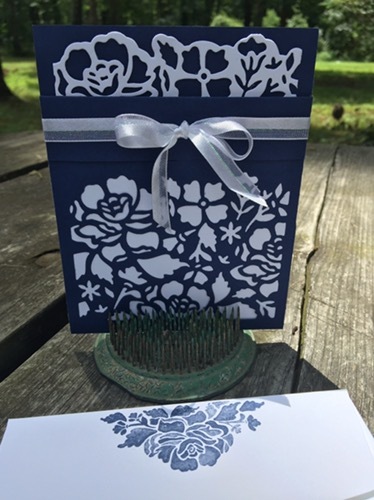 Then I embossed the panel using the lovely lace embossing folder from Stampin Up! 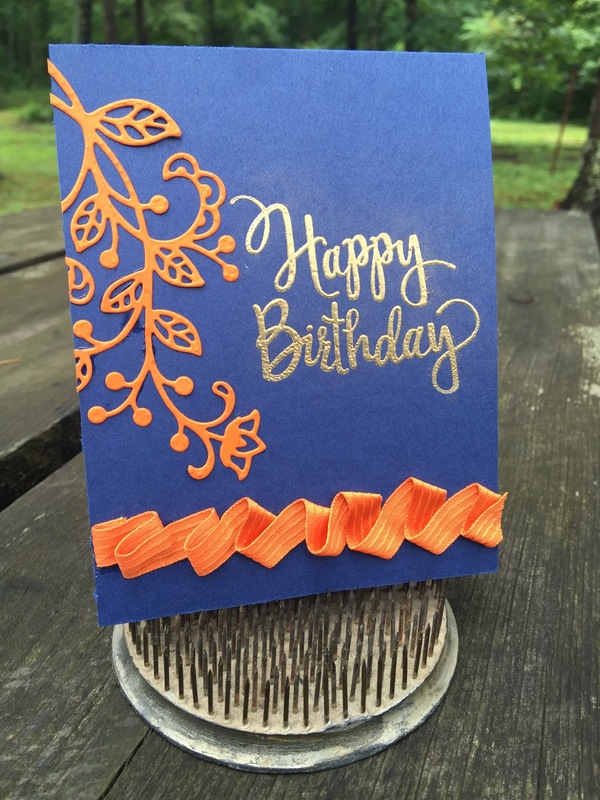 It gives the card just the right touch of texture. 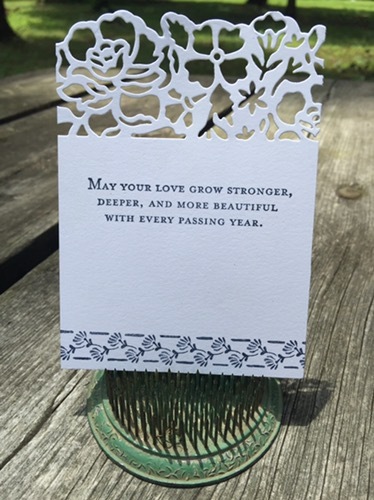 I used a get well sentiment from the new flourishing phrases stamp set and placed a small flower I punched and added a small pearl accent. I can’t wait to send this to a friend that has been ill. I think it will definitely make her smile! 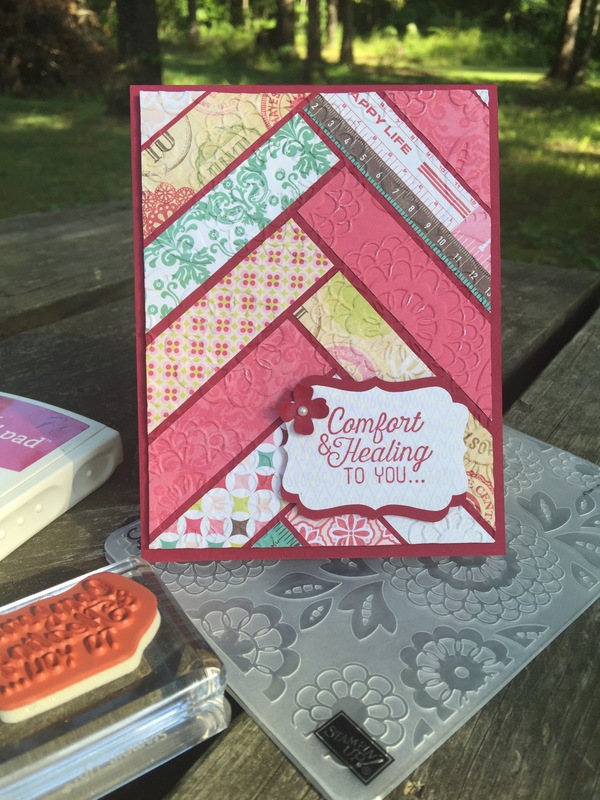 I haven’t really had a chance to play with all the new product Stampin’ Up released in June. Long story short I tore my MCL and have a bum knee so it was the perfect opportunity to sit at my desk. I love the new Floral Phrases bundle and had the perfect occasion to use it. A dear friend is getting married and her colors are navy and white. I used Night of Navy and Whisper White. I adore that color combination. It’s just simply elegant! I made a pull tab card just to make something a little different. I think the die cut adds a lot of visual texture. So what do you think? I think I need to stay inside and try to cool off this afternoon. It is hot and humid here in Arkansas. Hello! How are my crafty friends today? I’m doing fabulous and enjoying the first few days of summer break with my children. 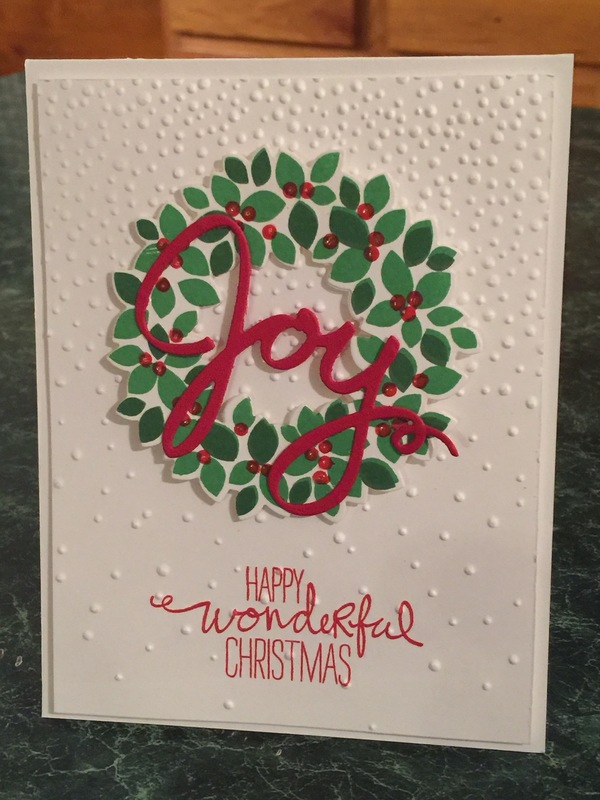 I wanted to show you a card today that I featured in my last Stampin’ Up class that was the overall favorite of that class. 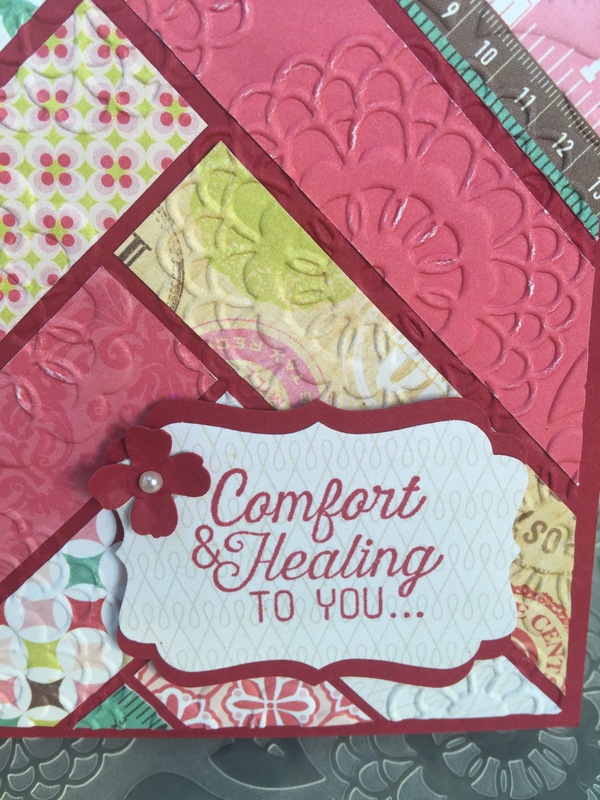 It features the Six Sided Sampler set from Stampin’ Up and uses a color pallete of slate, whisper white and daffodil delight. This is such a wonderful color combo that feels so fresh and modern. 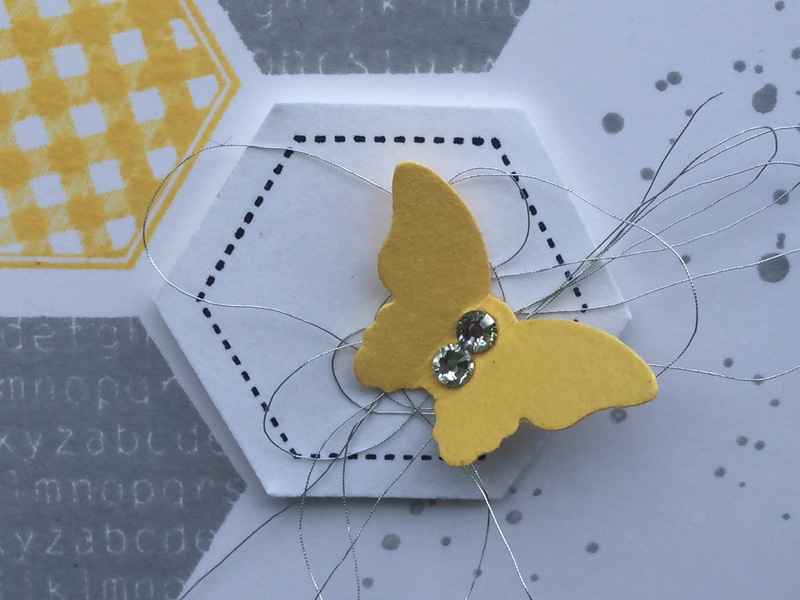 We also used the hexagon punch to complete our handmade card. I love the thick whisper white cardstock. Unfortunately both the hexagon punch and the Six Sided Sampler stamp set are retiring the end of this month so if you are interested you better snag them now! You won’t regret it.